The new BMW 2 Series Coupe is exactly what you expect a coupe to be – it’s fun to drive and great to look at. Though it’s totally affordable, it makes you feel like a million dollars. Enticingly, it’s also reasonably economical. The range is packed with exciting engines and models, including the high-performance, ballsy M2 Coupe. Meanwhile, the car’s hatchback origins mean you don’t have to settle for an impractical machine that can’t do the basics. 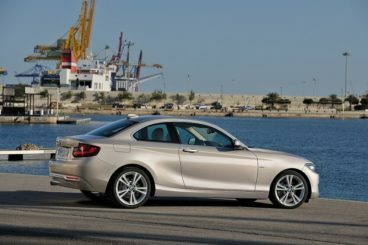 OSV takes a closer look at what it’s all about with our BMW 2 Series Coupe review. If you test a rival Volkswagen Scirocco and then jump behind the wheel of this 2 Series Coupe, you wouldn’t be able to stop grinning. In terms of its handling prowess, it leaves its non-premium competitors in the shade. Even the basic models get the right balance between comfort and handling, and there’s enough grip on offer as you enter bends so that you never lose your nerve. The steering does lack a bit of feel, but it’s accurate and well-weighted, while body lean is minimal. A 6-speed manual ‘box comes as standard, and it’s precise enough, but an optional 8-speed automatic is our preference. It’s smoother, and cheaper to run, but it does demand a premium of £1,550 over the manual transmission. The entry level 218d diesel engine can get you from rest to 62mph in an impressive 8.4 seconds, though the more powerful 220d makes mincemeat of those numbers, as it covers the same distance in just 7.1 seconds. You can get four wheel drive with this engine as an optional extra. The petrol engines aren’t expected to shift as many numbers as the diesels, which is a shame because we’d argue that they’re more suitable to this car. The smaller 220i can gun you from a standstill to 62mph in just 7.0 seconds, while the 228i is absolutely rapid, and covers the same yards in 5.8 seconds. There is also an entry-level turbocharged 218i model that does the 0-62mph dash in 8.8 seconds. 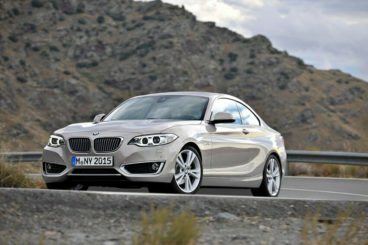 Then there is the small matter of the high-performance M235i model, which flexes its muscles in the same price range as the Porsche Cayman. It’s got lung-bursting performance, and comes powered by a six-cylinder engine that not only sounds great, but which can get you from rest to 62mph in 5.0 seconds. 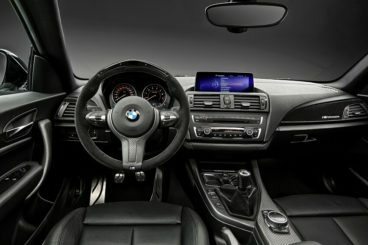 This 2 Series Coupe replaces the 1 Series Coupe, and while the interior is definitely an improvement, it still can’t compete with plusher rivals, such as the Audi TT. The cabin is a relaxed place to be thanks to good refinement, though it’s easy to disturb the peace if you push the diesels too hard. The standard suspension is setup for maximum comfort, though the M Sport springs are a bit firm and will limit body lean when you tackle corners. The dash is, as usual, very driver-oriented, but some of you might not be too happy about the absence of low seating. Soft touch plastics are the order of the day, and you can brighten things up by adding a number of colourful trims from the options list. The design is overall logical and driver-friendly, but it lacks a bit of finesse. Features that buyers tend to love in this class, such as a tall transmission tunnel and individual heater controls, are missing. The 2 Series doesn’t look quite as distinct or sporty as some of its rivals, and this is because BMW has given it a more conventional shape. The benefits of this are that it’s really rather practical. Rear legroom is good, while big windows let in lots of light and give what could have been a claustrophobic cabin a very airy feel. A pair of rear individual seats means you can’t fit 3 adults in the back even if you tried. But, this means that just two passengers will have lots of elbow room. Headspace is a bit cramped, though. Taller adults will be just fine up front, there are plenty of storage spaces, while the boot measures 390-litres of space. The SE and Sport models get cloth seats as standard, but if you want leather you will have to pay an extra £1,150. The Sport trim benefits from neat alloys, sports seats, a sports steering wheel and lashings of dark chrome, while the M Sport range adds 18” alloys. The list of optional extras is huge, and you might find that you want them all. We recommend the adaptive M Sport suspension, which is priced at £750, and the smooth 8-speed automatic ‘box, which will cost you a further £1,550. Prices for the new car start out from £23,000 and rise to £35,000. If you want to lease the 2 Series, you can pick up a deal from as little as £221 per month + VAT. For more information on our leasing deals, you can check out our page here. In terms of running costs, the new coupe does very well. The cheapest engine to run is a 218d diesel unit, which BMW claim can return fuel economy of 70.6mpg. It has to be said, though, that to achieve this figure consistently you would have to drive like a saint. The 220d is a better overall choice, and is good for returns of 64.2mpg. Emissions will vary, though, according to how big your wheels are. The petrols are more expensive to run, with the turbocharged 220i model able to return 44.8mpg with the smallest possible alloys. The more powerful 228i model is good for 42.8mpg. The 218d model is the cheapest to insure, and occupies group 20, while the high performance M model sits in group 39. What truly sets this coupe apart from the chasing pack is its handling prowess. Keener drivers won’t be able to contain themselves. The 1 Series was a bit bland and dated, but things are much improved here. Everything is neatly executed, and the cabin is stylish and upmarket. The diesel engines are among the most frugal in this class, and the petrols aren’t too bad either. The diesels are usable enough, and they’re also cheap to run. But what mars them is the gruff noises they spit out when idle. It’s better than the 1 Series, but it’s also significantly more expensive. Let’s see how the car fares against its rivals in the comparison section of our BMW 2 Series Coupe review. 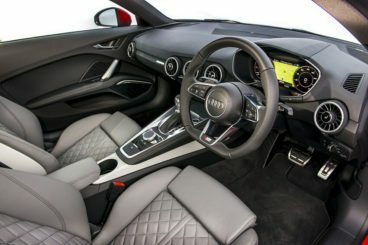 The new Audi TT Coupe is slick, stylish, and boasts one of the smartest interiors in this class. It’s also surprisingly inexpensive to run. 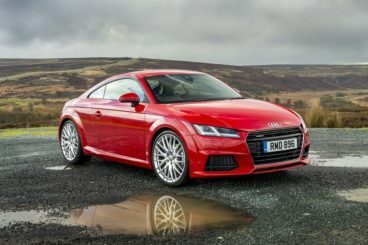 The TT Coupe has always looked like it would be great fun to drive, but its reputation has usually preceded it. However, this time around it’s safe to say that, thanks to a lighter build, the TT is really rather entertaining. It’s also remarkably comfortable, and feels quicker than ever before. Its sharp handling is helped by the brand’s progressive steering system, which makes it really easy to move the car in and around the town. The best engine in the range is a TDI Ultra diesel unit which is cheap to run but still manages to match the front-wheel-drive petrol variant’s characteristics. It’s also two-wheel-drive only, but it can still get you from rest to 62mph in just 7.1 seconds. The basic 1.8-litre petrol unit is a bit too small for our liking, with the 2.0-litre TFSI engine being a better pick. It’s faster in a straight line, and feels a lot smoother. It’s also pretty efficient, and takes 6.0 seconds to get from a standstill to 62mph. If you want as much pace as possible, go for the TT S model, which does the 0-62mph dash in less than 5.0 seconds. If running costs are a priority of yours, you don’t need to worry too much about spending a fortune if you choose the right engine. The Ultra TDI diesel is the most frugal in the range, and is good for 62.8mpg. The TT sports a rich interior that is as contemporary as they come. Opt for the Magnetic Ride suspension and it’s also supremely comfortable. The seats are well sculpted, exterior noise is well cut-out, while the dash is minimalist but very classy. It’s all premium stuff, with a 12.3” high-res colour display a highlight. It isn’t a very practical car, though, and although it does come with a pair of rear seats, they’re really only to be used occasionally, or as extra luggage space. In terms of its dimensions, the Audi TT Coupe 2016 is no bigger than last time, which means interior space is good up front but cramped in the rear – even for kids. The boot, meanwhile, measures 305-litres. The new Volkswagen Scirocco Coupe is what you could call an affordable coupe that is designed to rival the likes of BMW and Audi. It’s a few years old, though. Is it still relevant? The driving experience is not exactly polished, and definitely, can’t have as much fun in a Scirocco as you can in a 2 Series Coupe. With that said, the VW can still tackle bends with vigour and confidence, while Dynamic Chassis Control turns the excitement up a notch. The petrol range kicks off with a lively 1.4-litre petrol TSI unit which doesn’t cost much to run, and which can get you from a rest to 62mph in 9.3 seconds. It isn’t especially fast, but has enough mid-range acceleration to be termed sporty. The 2.0-litre TSI petrol covers the same distance in 7.4 seconds, while a 217bhp variant does it in just 6.5 seconds. The show-stealer, though, is the Scirocco R’s 276bhp 2.0-litre power plant, which takes care of the 0-62mph sprint in a matter of 5.5 seconds. There are also a pair of diesel engines to choose from, starting with a rather sluggish 148bhp and a marginally quicker 182bhp unit which does 0-62mph in 7.5 seconds. 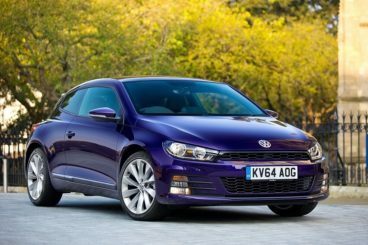 The Scirocco Coupe 2016 has good second hand values, and should retain half of its original value after 3 years. It’s cheap to run, with the most frugal diesel returning fuel economy of 67.3mpg. 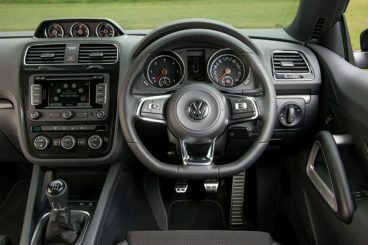 The VW’s interior is of a high quality, and build quality is excellent. The transmission tunnel isn’t particularly tall, which gives the interior a cockpit-esque feel, but we’re not convinced by some of the dials on the dash – it seems like they’re there simply for a bit of effect. Comfort is guaranteed, thanks to adjustable seats and steering wheel, while you can pick and choose which colours you want to deck the cabin out in. Small windows can make things feel a bit claustrophobic, but adding brighter colours will enliven things a bit. Practicality is reasonable, but visibility is not fantastic. This is due to the low driving position, which limits your view. It is, however, a very spacious car, and two adults should be relatively comfortable in the rear. Access is compromised by a low roof, but there are lots of storage spaces in here. The boot, meanwhile, is sized at 380-litres, which is very impressive. This is how a coupe is meant to be done. The 2 Series delivers excellent performance, doesn’t cost a fortune to run, and can offer the smoothest eight-speed automatic gearbox in the class for effortless drivability. Keener drivers should be dying to get their hands on this agile machine that is one of the brand’s best cars in recent years. The BMW 2 Series Coupe might look a bit more conventional than some rivals, but it tans them on excitement, power and – perhaps most importantly – practicality.